This is just one part of the Scaling Rivet&Sway process. The first step was to install the APC, it's such a must have that I had that covered in the Setting up Drupal on AWS page. After that more steps where taken to improve performance further, load tests where done after each change to measure performance, you will find those at the bottom of the page. Drupal is extremely database heavy, among other things it caches generated html pages in some database tables, of course pages are large so it's not very efficient. Redis allows us to cache all that data in memory, which is way way faster than having to query a remote database. While it's not safe or practical to cache everything from Drupal in Redis, all the caches can be and should. Redis is pretty smart too, so there is not much need to deal with clearing caches, it sort of behaves simply like a drop-in proxy in front of the underlying DB. Redi also allows backing up the cached data to fie so that it can be reloaded into memory after a restart, That has a huge benefit with Drupal because Drupal perform very poorly with a "cold" cache after a restart and it can take upward of 10 minutes to improve (which can very tough cause issue restarting under high load). Apache+mod_php gets easily overwhelmed under high load especially since mod_php has to bootstrap php for all requests. Also since Nginx being asynchronous it handles traffic spikes much better (I've tested this theory and it's no contest). I also tried Fastcgi instead of Php-Fpm, I can't say there was a clear winner as they had different strength and weaknesses in my load tests. Php-Fpm is a bit simpler to install an possibly more stable. At first I tried to have Nginx in front of Apache to serve static content only and pass the rest to Apache but the gain was not as much as expected, so it's juts simpler to have Nginx handle everything. First I turned off apache and disabled it from running at start-up, we would not want it to start and bind to the http port ! Note that some versions of Ubuntu have different behavior, listening to a socket instead. root /usr/share/drupal; ## <-- Your only path reference. sudo ln -s ../sites-available/yoursite.conf . At this point you are a pretty optimized Drupal base that ca scale pretty well, vertically at least. One roadblock to scaling Drupal horizontally is the fact it stores some files/content in the local file system(Uploaded files). Obviously that's problematic as we don't want multiple webheads which each their own independent file system. GlusterFs : While that sounds like a good option it's a much more complex solution than I wish for. There are other options, see a Good article from Pantheon on this. In my case I ended-up using Amazon S3 in part because I was already on an Amazon infrastructure. 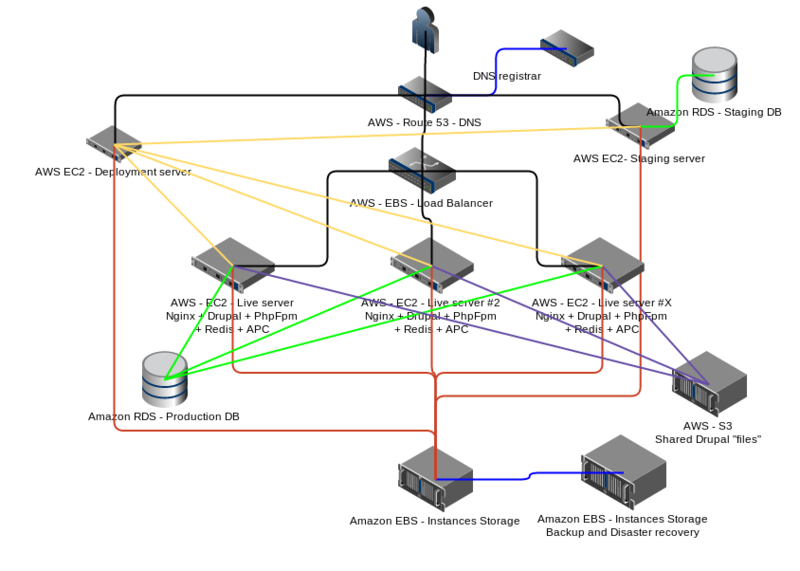 Can easily leverage Amazon CDN later if needed. It's HTTP based so while read and writes are fairly fast forget doing any sort of search. Everything is stored together, there is no real concept of directories internally. So anyway what I did is create an S3 bucket and mount it locally, WITH A LOCAL CACHE, that part is very important because of the potential, albeit rare, high latency issues S3 can have. It's very important to realize the trade-offs of S3. For example we had once script that would search/iterate a folder for files to process, on S3 that was so slow as to be unusable. That code was modified so it knew individual files paths rather than having to search. Forget about using tools such as find or grep against an S3 file system, although you can run them on the cached copy of course. Be very careful that there are two different software called s3fs and you want to be sure you have the right one. Also the ubuntu repos had a very obsolete version ! So I installed s3fs from source to make sure it was the correct and recent version. At that point it's possible to scale horizontally. Even better I was able to create an image (AMI) from this webhead and then be able to juts launch more instances either manually or on demand, behind a load balancer, making for a much more reliable and scalable site. Another benefit is that it makes it easy to take instance in and out say for maintenance with very little impct on the customers. It allows for packaging an image "As is" and juts starting it and adding it to the ad balancer to scale. All instances are exactly the same with the one lone exception that I consider one the master because it's the only one that runs cron jobs (I rather not have cron job ran from multiple instances). If yet more performance is needed we could cache all content behind either Varnish or Nginx. I would actually probably use Nginx as this doesn't add yet another new element to the mix. Also when we where on Pantheon it had Varnish and I didn't like the experience, it could only can HTTP and not HTTPS adding a lot of complications. Also this layer of caching made for some very tricky bugs that one persn might get and not another plus the usual pains of cache invalidation. Another thing to explore is using a CDN such as cloudfront for most static content, in particular to store the mostly "static" content such as images and so on. This is something I might revisit later as this would offload the load on the Drupal server. But then again it adds another layer of cache invalidation issues. For example it an take time for changes to propagate over the CDN edge servers this can potentially cause inconsistent results while it's ongoing. An even much better thing to explore would be to replace Drupal / PHP with something efficient and well designed. Our live system use C1 medium instances as in my test I found Drupal was more CPU than memory hungry and so it did better with such an instance (only 1.7GB of memory but 5 processing units). We could do with smaller instances for sure, but t's nice to have some room to handle spikes. A different strategy would be more instances of a smaller type but then you have more instances to deal with and keep in sync so it's a trade-of. YMMV. My load tests where all ran against a single "small" EC2 instance. I tested both with a custom jmeter test as well as with a "cycling" loader.io cloud based test (cycles more and more users sending queries as fast as they can). Note that under high load right after a restart or cache clear (ie: nothing is cached) it performs very very poorly and can be easily overwhelmed with as little as 20 concurrent users while it's starting (Redis solves this issue). Nginx in front of Apache for static files. Removed Apache and Nginx serves all. Performance started degrading passed ~ 180 users(~3 minutes) however unlike with Apache it kept working, just more slowly. Loader.io scaled to the full 200 cycling users without errors with all requests under 4 seconds, the only setup that completed without errors. I still find those results quite pathetic, it speaks a lot about how inefficient a platform Drupal is. I wrote some system as far back as 2001, in 'slow' Java mind you, on a single pentium server that could handle 10-100 times this.